The other day my friend Faith came over with a friend of hers visiting from Germany. Faith had asked if she could show her friend my studio and I was delighted to welcome them in. I had such fun encouraging them to try weaving in the studio, then spreading my inventory of towels on the dining table while they shopped. 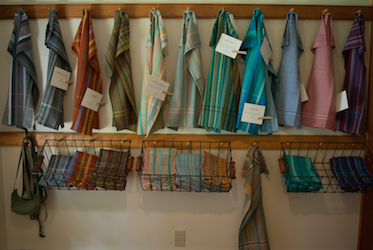 (The photo shows a display of towels I created for my Studio Warming Party back in June.) Once Faith and her friend made their selections, we cleared the table and discussed this & that over tea and cake. As I waved good-bye to Faith and her friend, I wondered how I might create this kind of experience for you online. I can’t open all my towels with a flourish for you and offer you tea & cake, but I have put together a short photographic tour of my studio. My studio is at the back of the house in the room with the best light. As the seasons move toward fall, the sun is once again shining through the windows filling the room with inviting light. I have two floor looms, both of which are small as far as floor looms go and perfectly adequate for what I like to weave. Having two looms allows me greater flexibility with projects. Setting up the loom takes a lot of time, so once it’s set up for a particular design, I like to weave that design in different color combinations before switching to a new design. Here’s the loom my mother bought me when I first learned to weave. I sit on a bench with my back to the shelves so I can see out the windows. Sometimes I’ll have music playing in the background, but usually I prefer silence and the sounds of the loom. My scissors and the shuttles I am using for a project live next to me on the bench. Other tools and useful items are within arm’s reach on shelves. The most frequently used are the little pin cushion – for when I need to fix a broken warp thread – and the cup of tea. When I’m sitting at my desk, I look up and gaze out the windows or at this cotton, the cotton I use for towels and napkins. I keep a tube of each color here, and store more in the large sewing chest I inherited from my grandmother. I’ve organized the tubes by color family, making it easy to find what I’m looking for. I’m often struck though by the blurry boundaries between the families. For example, does the cayenne belong with the reds or the oranges? Sometimes I’ll get an idea for a color combination I want to try and put those tubes on the top shelf. I can see how they might work together, although twisting the threads together gives me a better idea. My counter-height desk is usually the messiest part of my studio. I’ve arranged it so that there is a sitting side for writing, computer and design work, and a standing side for quick weaving-related activities. I stand here and consult the sample I’ve woven as I decide how to weave the next towel. I weigh tubes of cotton before and after each towel, so I know whether I have enough of a particular color. I jot down a couple of notes so that I can make each towel a little different. All these notes, along with charts showing the color sequence and pattern information come in handy for subsequent projects. 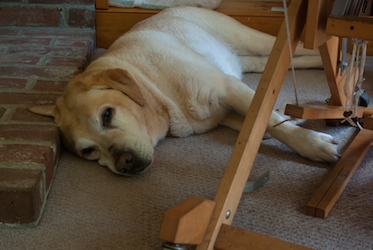 Codi, also known as my CHO or Chief Happiness Officer, has a bed below the windows, but lately she has taken to snoozing beside this loom. My invitation to you: Now that you’ve seen my space what questions do you have? What else would you like to see? Is there a space in your home where you do creative work? I’d love to hear about it. P.S. If you are in the area and would like to come over, please do contact me. I’m also planning an Open Studio in late November or early December. There will be a chance for you to try your hand at weaving. You are most welcome, Judy. 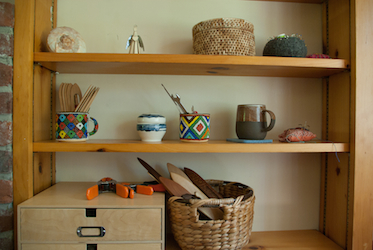 I’m enjoying this space and happy to have my weaving things together in one room. 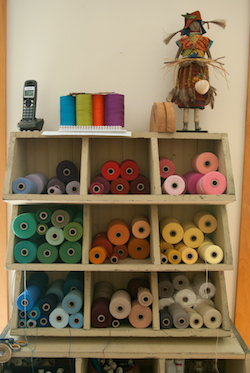 I enjoyed the tour of your loom space(s) Marilyn–it’s inviting and colorful. I LOVE the new bolder colors! Thanks so much, Sheryl. The bolder colors and designs are an adventure! 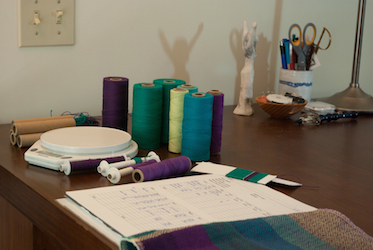 Marilyn, what a lovely and light filled weaving studio you have. As a fellow weaver I always love to see how other weavers set up there work spaces. Love the towels displayed on the hooks, great idea. Lovely studio, simply lovely. Thanks, Martha. The hooks are where we normally hang our coats! I’d love to see your studio. Any chance you can send a photo or two? I am brand new to the weaving world. I just finished my first class, where I made a double weave sampler. I was scared I was too new to be in the class, but everyone assured me that they would all be learning something new and that I should go for it. Well I did – go for it that is and I’m hooked! 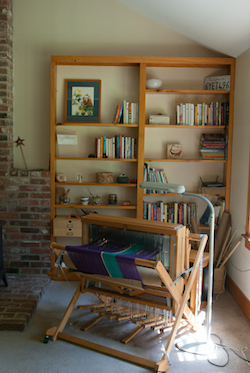 Now I need a loom and a lovely weaving space like the one you shared on your blog. I am mostly interested in making serviceable projects like tea/dish towels, etc. So, while searching for patterns that I might be able to understand, I came across your beautiful rainbow towels. I LOVE them. I have a couple of questions: Would you ever consider giving a class? What kind of floor loom is shown in your photo (it looks perfect for my needs)? And, would you happen to sell one of your towel patterns? Thanks! Welcome to the wonderful world of weaving, Susan! It’s easy to get hooked. The floor loom in the photo is an 8-shaft Baby Wolf made by Schacht. My mother bought it (used) for me when I first started weaving and I’ve enjoyed using it. It also folds up and fits in my CR-V so I can take it to workshops, or when I talked with first graders about weaving. I do not sell my patterns, but I can point you to some other resources.